I have three techniques for making the juiciest chicken thighs you will ever eat. We're going to pan roast them, make crusty boneless and skinless chicken thighs, and bake chicken thighs in the oven. I recently made a YouTube video for 3 ways to make the perfect chicken breast, and you guys loved it. 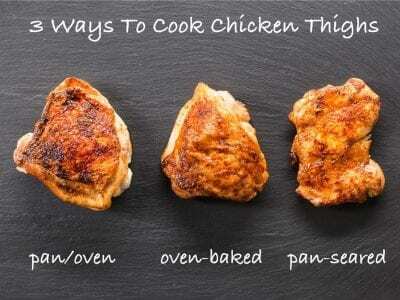 So I thought I would follow that up with the ultimate guide on how to make chicken thighs. 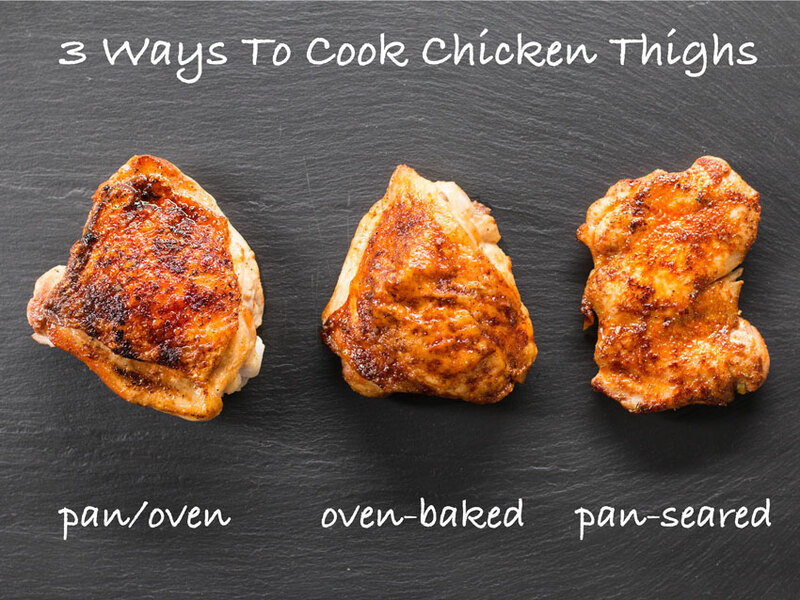 I have 3 techniques that are sure to render the most juicy, tender chicken thighs you have ever made. The first technique is my favorite.The chicken thighs start out on the stove-top and finish in the pan to make the crispiest skin ever! 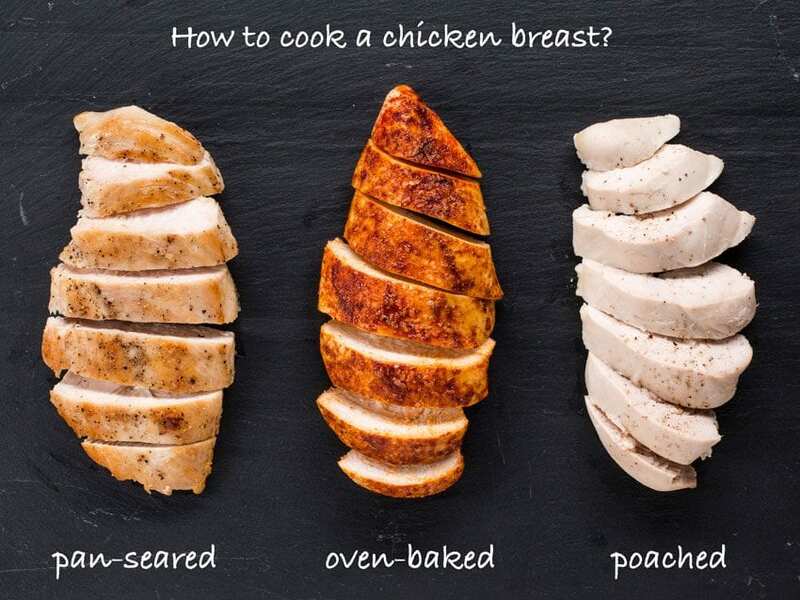 Make sure to check out my guide for making chicken breasts. This could be the best way to make chicken thighs ever! The skin gets insanely crispy and the meat juicy as can be. This method for coking chicken thighs involves a cast iron pan, the stove-top, and the oven. 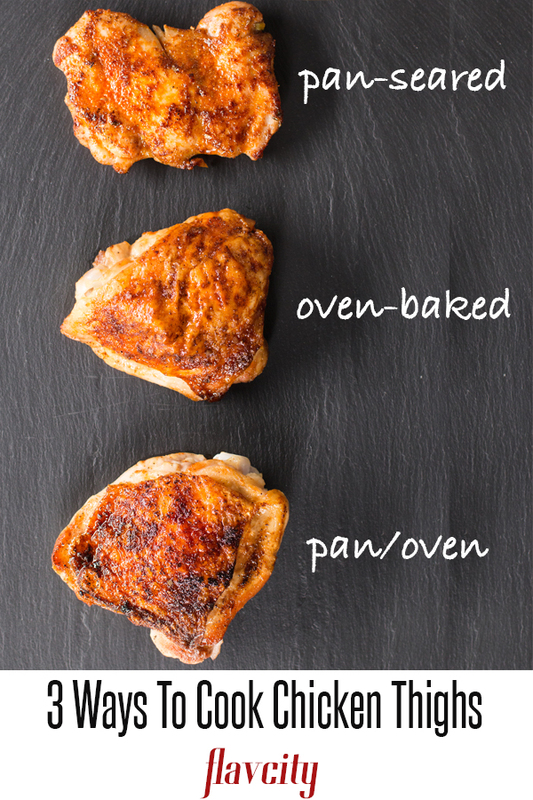 Here are the steps for making the chicken thighs. 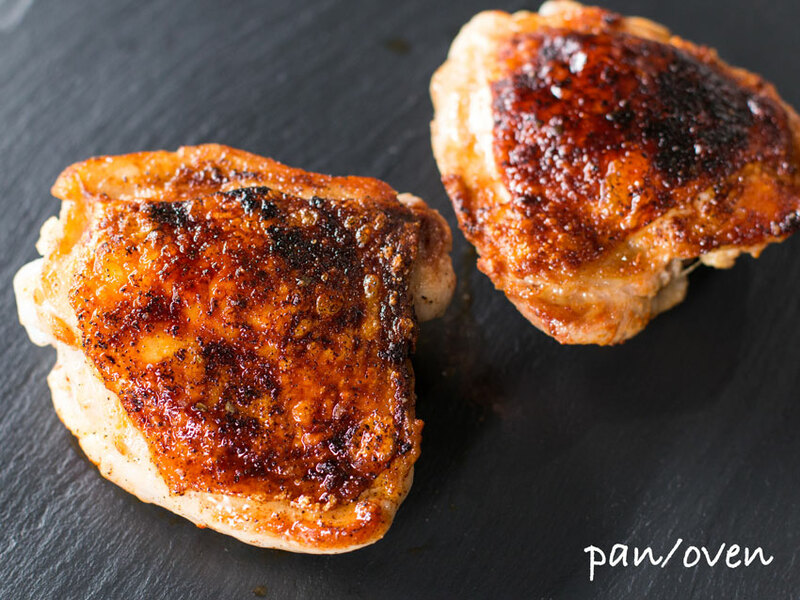 Allow the chicken thighs to sit at room temperature for 20 minutes. Cold meat in a hot oven or hot pan will cook unevenly and be tough. Make sure to pat the skin dry with paper towels, moisture will prevent the skin from getting crispy. Season the chicken all over with salt and a good amount of smoked paprika and cayenne pepper only on the skin side. Rub the spices into the skin with your hands. Preheat a large cast iron pan over medium-high heat for 2 minutes with 2 tablespoons of oil. Once hot, add the chicken thighs skin side down and allow them to cook for 8 minutes undisturbed. No need to move the chicken around, just let them do their thing and get nice and crusty. Move the pan to the oven and let them continue to cook skin side down for 9 minutes. Flip and cook another 3 minutes. Once the chicken is out of the oven, move to a clean plate and allow it to rest for 5 minutes. If you cut into the chicken thighs now, the juices will spill out and the meat will get dry. You will be amazed at just how crispy the skin is and the way the spices have seared into the crust. This is the next best thing to fried chicken, and much healthier. If you need a side dish for these chicken thighs, try my low carb golden cauliflower rice or roasted spaghetti squash. Boneless and skinless chicken thighs cook very quickly and have much more flavor than chicken breasts. The first thing is to apply the spice rub to both sides of the thigh along with a generous pinch of salt. The spice rub is a great way to add big flavor without adding any fat or calories. Spices like smoked paprika, cumin, coriander, cayenne, and thyme will make the most flavorful spice rub for your chicken, so make sure to always have your pantry stocked with some spices. Preheat a cast iron or non-stick pan over medium-high heat for 2 minutes with 1 tablespoon of oil. Once the oil is hot, add the chicken thighs and let them cook for 4 minutes. Once again, don’t touch the chicken thighs once they go in the pan, let them get nice and crusty. Flip and cook another 3-4 minutes. Allow the chicken thighs to rest 3-5 minutes and enjoy. 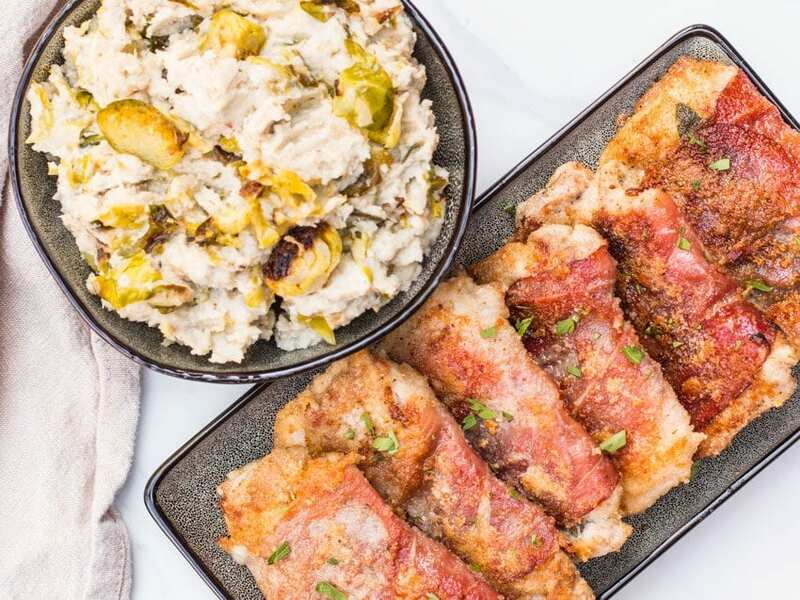 I have some yummy chicken thigh recipes, like this chicken saltimbocca with low carb mash and fennel spiced chicken thighs with roasted cauliflower salad for lunch. To bake juicy chicken thighs in the oven that have crispy skin you first need to let them sit at room temperature for 20 minutes. Cold chicken in a hot oven will cook unevenly and the meat will be tough. To help the skin get crispy, pat the moisture off the skin with paper towels. Season the chicken thighs with the same spice rub above, or use some sweet paprika, salt, and black pepper. The key is to cook the chicken thighs in a 400 degree F oven for 50 minutes. This will allow for the skin to get crispy and the meat to be juicy. If you are not sure the chicken is ready, just poke it wit a knife. If the juices run clear it’s done. 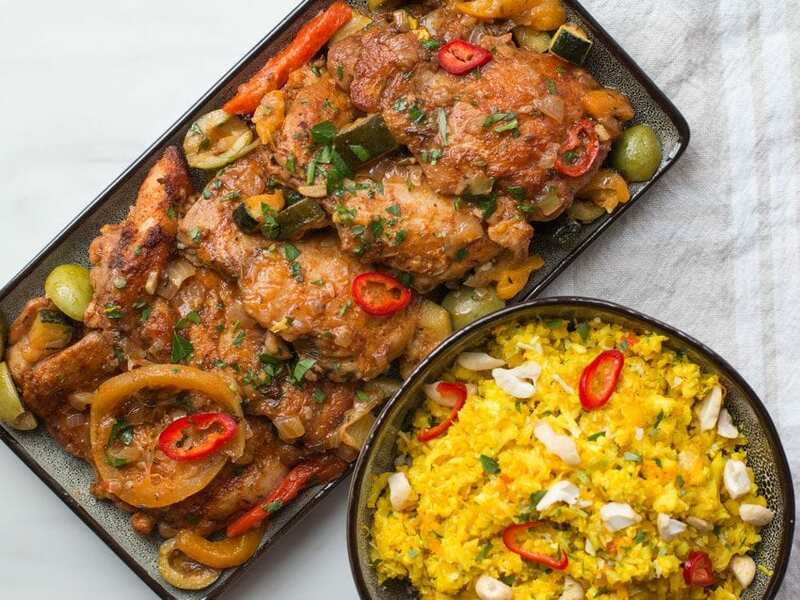 How Long Will Chicken Thighs Last In The Fridge? Cooked chicken thighs will last in the fridge for 5 days, or can be frozen for 3 months. When time to reheat, thaw and place in a 350F oven for 7-10 minutes. Drizzle a shot of olive oil over the chicken before warming to help keep it moist. If reheating in the microwave, cover the chicken with a wet paper towel and make sure not to overheat, as the chicken will dry out. 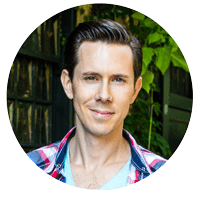 I am going to show you how to cook the perfect chicken thigh. These three chicken thigh recipes are fool proof, and involve the pan, oven, and pa roasting. For the pan roasted chicken thighs, pre-heat oven to 475 F. Combine the smoked paprika and cayenne in a small bowl and mix well. Pat the chicken skin dry with a paper towel and season with a generous pinch of spice rub on the skin side only and allow to sit at room temperature for 20 minutes. Pre-heat a large cast iron pan over medium-high heat with 2 tablespoons of oil for 2 minutes and season the chicken with a generous pinch of salt on both sides. Once the pan is hot, add the chicken thighs, skin side down, and allow them to cook undisturbed for 8 minutes. Transfer the pan to the oven and allow to continue cooking skin side down for 9 minutes, flip chicken thighs and allow to cook 3 minutes more. Remove from oven and transfer to a clean tray, allow chicken to rest 5 minutes before eating. You will want to use a splatter guard the entire cooking time to avoid oil from splattering everywhere. For the boneless and skinless chicken thighs, make the spice rub by combining the smoked paprika, cumin, coriander, cayenne, and dried thyme in a small bowl. Mix well and first season the chicken thighs with a generous pinch of salt and then spice rub on both sides. Drizzle a shot of oil over the chicken and rub the spices into the meat. Allow the chicken to sit at room temperature for 20 minutes. Pre-heat a pan, preferably cast iron but non-stick will work, over medium-high heat for 2 minutes. Add 1 tablespoon of oil, allow it to heat for 30 seconds, then add the chicken thighs. Cook for 4 minutes undisturbed, this will allow the crust to form. Flip and cook another 3-4 minutes until done. 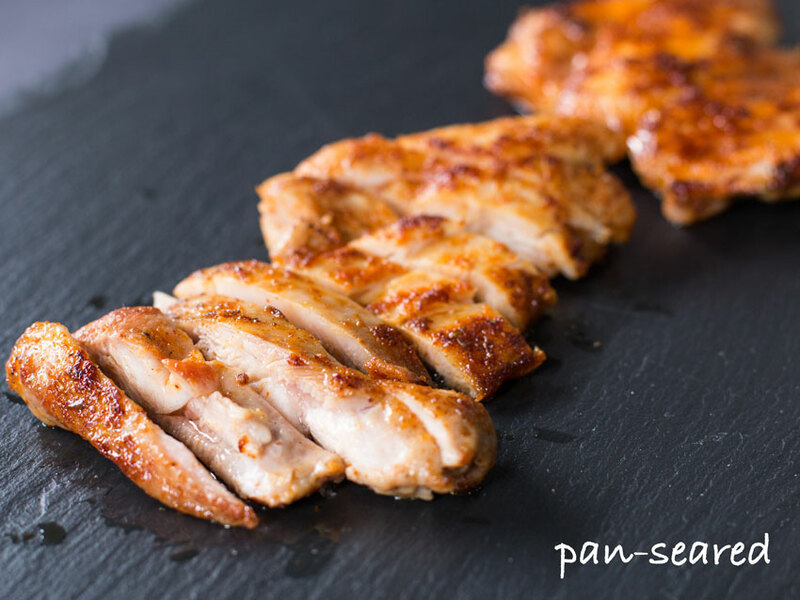 Remove chicken from pan and allow to rest 3-5 minutes before enjoying. For the oven baked chicken thighs, pre-heat oven to 400 F and allow the chicken to sit at room temperature for 20 minutes. Pat the chicken skin dry with a paper towel and season with salt and pepper on both sides and paprika on the skin side only. 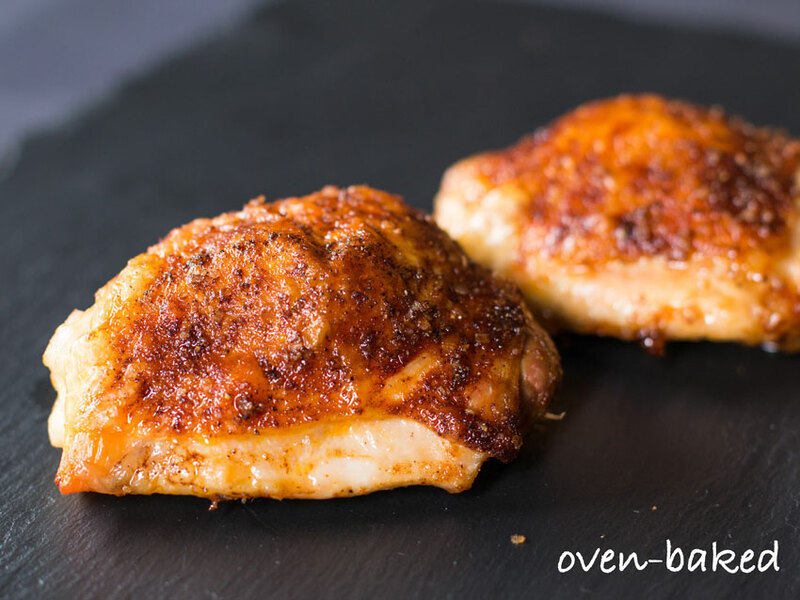 Place the chicken thighs on a sheet tray and bake in the oven for 50 minutes, or until the internal temperature is 155 F. Pull the chicken thighs from the oven and allow to rest for 5 minutes before enjoying. If you are not sure the chicken is done, you can poke it with a knife and if the juices run clear it is ready. Thank you for publishing this! I pan fried boneless skinless thighs for the first time following your recipe and it was DELICIOUS. Crispy and tender. Best of all it was fast and so easy. Looking forward to trying more of your recipes. Thanks again! Concerning the Pan to Oven method what is the temperature of the oven please? The oven temp is 475F. Hi Bobby, what would be the cook times per side for bone in chicken thigh solely in the cast iron? Hey Bill, i would recommend searing in the cast iron and then transferring to the oven, it won’t work just on the stove top. Some toddler chicken recipes please! Hey Tony! So glad to hear it!!! Great job! How can it be that in recipe one you cook for 8 minutes in the pan and 9 minutes in the oven (17 minutes), and for recipe two you cook for 7-8 minutes TOTAL and it’s done? I realize the spice rubs are different but that wouldn’t affect cooking time so much? The one that needed more time had the bone in. Boneless doesn’t need as much cooking time. Pan fried / oven baked is fantastic and easy! Thank you! Nice! I love the pan-fried one. Keep on cookin’! Followed your cast iron skillet directions for bone-in, skin on and just wanted to let your southern followers know, HALLELUJAH! your hot skillet to oven technique also worked perfectly using a gas grill! I look for ways to avoid cranking up the oven temp during summer months if at all possible . I followed your instructions exactly. Instead of burner to oven, I pan fried over direct med-high heat on one side of the grill, then slid the skillet off the flame to the un-lit side and closed the lid. (Leave the burners on, just move the pan from over the flames.) The indirect heat will bake just like the oven. Flip it, close the lid for a few more minutes and WOW! Fabulous moist inside, crispy outside! 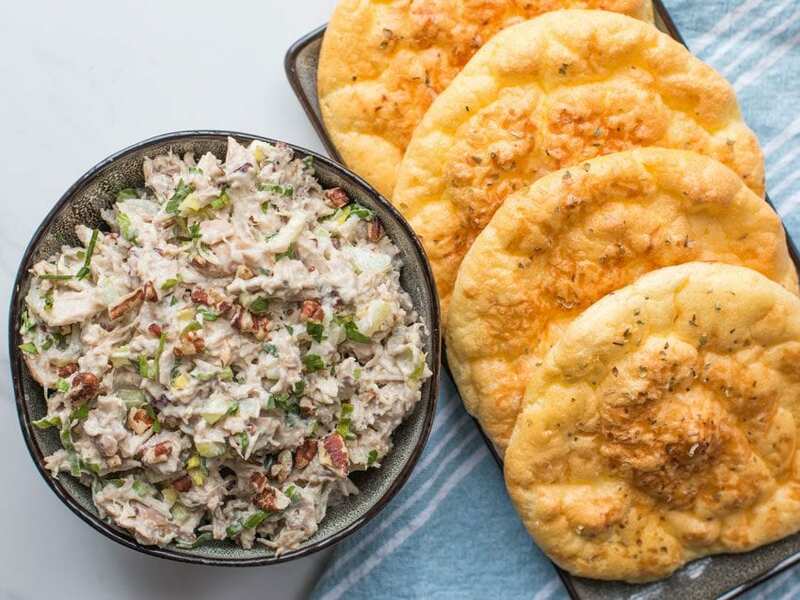 This recipe is a bases loaded home run! Delicious flavor, no grease splatter in the kitchen and the house stays cool. That is great! We always love hearing people adapt recipes to their tastes and to their environments! So glad it worked so well!